States Life-Saving Service, which ran from 1848 until 1915 for the purpose of rescuing sailors and passengers stranded on wrecked vessels. Modern technology and conveniences like radios and helicopters and speed boats that are used by the current Coast Guard were not available in the late nineteenth and early twentieth centuries, so the Life-Savers relied on special equipment, rigorous training, and manual labor to preform their duties. Today I want to tell you about the real life rescue of the L.C. Waldo, which occurred only a hundred miles from where I live. In November of 1913, the Great Lakes Region experienced the strongest storm (or series of storms) ever on record. This "Freshwater Hurricane" blew winds of about 70 mph coupled with temperatures of about 24 degrees Fahrenheit across Lake Superior. The L.C. Waldo was a 450 foot freighter loaded with ore and bound for Lake Erie when the storm hit. The Waldo faced winds and seas so harsh that the pilot house and was torn away and the steering damaged. 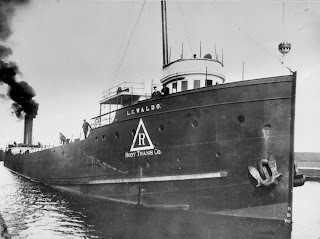 The master of the Waldo attempted to steer the mammoth steamer to shelter by slipping into the large bay behind Lake Superior's Keweenaw Peninsula. 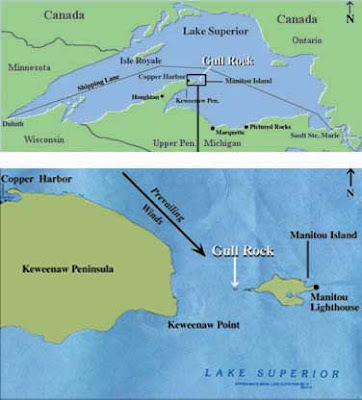 But in attempting to reach L'anse Bay, the vessel ran aground on Gull Rock, a little patch of rock and reef two miles off the coast of Michigan. The Waldo then broke in two, and the crew took shelter in the forward part of the steamer, where the freezing waves and spray soon formed a wall of ice that sealed them inside. The 22 men crew, two women, and dog aboard then endured almost four days being stuck inside the hull of the steamer without food as they waited for rescue. The Eagle Harbor Life-Saving Station, 30 miles away, learned of the wreck the next day. Their larger boat (the lifeboat) was under repair, so the crew set out in the smaller surfboat. They made it only 8 miles before the ice buildup on the boat forced them to turn around. Rumor says that some of these men were actually frozen to the ropes on the boat when they returned and had to be cut out by townsfolk. For the next day, the Eagle Harbor Lifesavers worked furiously to repair the lifeboat so that they could head back out to rescue the crew of the Waldo. The Portage Life-Saving Station, located 60 miles from the Waldo, didn't learn of the the steamer's wreck until the following day. With their lifeboat in tact, the Portage Keeper left for Gull Rock, opting to take the longer route through L'anse Bay, which afforded more protection from the elements by going around the back side of the Keweenaw Peninsula. The keeper also arranged for a tugboat to meet them at the mouth of the Portage Waterway and pull the lifeboat the rest of the way to the wreck. Both the Portage Lifesavers and the Eagle Harbor Lifesavers arrived at the Waldo in the early morning on November 11, reaching the wrecked steamer within minutes of each other. The lifesavers used axes to cut away at the built up ice sealing that sealed the crew inside the hull and saved everyone aboard, even the dog. For their bravery, the lifesavers from both stations were awarded Gold Lifesaving Medals for their heroism. So there you have it, a real life story of true lifesavers, and hopefully a good example of why the United States Life-Saving Service was so important. Such courageous heroes and true lifesavers! Thank you for sharing the rescue of the L.C. Waldo. A couple of years ago, while on vacation, we visited the Chicamacomico Life-Saving Station on the Outer Banks of North Carolina. It is the largest, most complete USLSS complex in the nation and one of the few life-saving station sites in the nation with all its original buildings. It was so fascinating to visit!! That must have been really fascinating, Britney! I've toured the station up in Eagle Harbor, but nothing so complex as the one in N.C. How fun! Hi Bethany! If you google "freshwater hurricane" you'll get a page about it on Wikipedia. But the main answer is No, we don't get hurricanes around the Great Lakes. 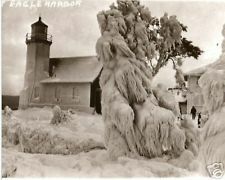 There was a very odd, and unusual meeting of two storm systems over the Great Lakes in November of 1913, and nothing similar has happened since. The storm system produced hurricane force winds (though nothing as severe as a Category 5). And the storms were very destructive to the shipping industry because there were lulls over the several day storm period. So the harboring ships thought the storm was abating and struck out into deep waters only to get another bout of storms back. Actually, one of the freighters lost in Lake Superior during this storm was just found earlier this spring near Marquette. Lake Huron ships suffered the most destruction of all the lakes. Hmmm. Something tells me maybe I should do a blogpost on the Freshwater Hurricane, huh? That gives a whole new meaning to "Where's Waldo", doesn't it? This is a wonderful story of the determination of the human spirit to survive and to save others. Thanks for sharing it, Naomi! What a dramatic story, Naomi, and one I'd never heard! Those Life Savers certainly earned their medals. We often hear of life and death scenarios playing out on the oceans, but the Great Lakes have had their share of maritime drama. Thanks for sharing this! It must all be where you live, because I know a lot of live and death stories of the Great Lakes, particularly Lake Superior. There are shipwrecks you can dive that still have dead bodies floating around inside because the water is so cold nothing decays, and the fresh water doesn't have all the erosive organisms that salt water does. Loved the post. Thanks for sharing! 200 inches of snow? I love snow. Please send some down my way in Virginia. Thank you! 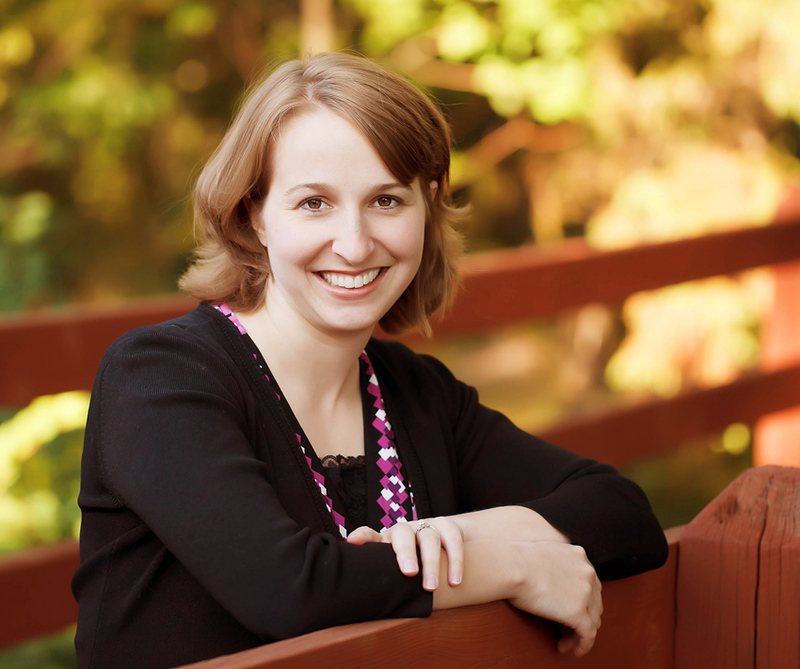 Can't wait to read your book! Amazing story - what bravery! I love the Great Lakes area - lived in an apartment on the banks of Lake Michigan in St. Joseph, Mi. for a year, absolutely loved it - but the weather could be fierce. The weather could be much milder, even a mile or two inward from the water. A young man was swept away by waves while walking out towards the lighthouse when I lived there. I have always wanted to visit the upper peninsula - have only been to Mackinac Island. Are you ever stranded by the snow?